Most ancient Greek plays are brought into English by Greek scholars. The problem is that Greek scholars do usually not have the experience of making a play come to life before an audience in the theater. The problem is compounded by the fact that the authors mounted the plays, so the old texts have no stage directions. In fact they do not even identify the speaker of each line. 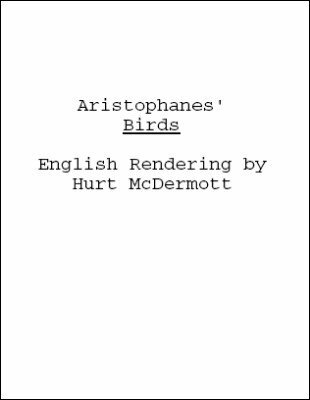 Although Hurt McDermott is not a Greek scholar, he is an award winning playwright and film director who knows what it takes to bring a text to life. In the 3 years he wrestled with BIRDS, he came to believe that the play only made sense with the death of one of the main characters - a death that is lacking in every other currently available English translation. This death of one of the two main characters, engineered through the machinations of the other, injects the urgency and contemporary relevance needed to make this timeless classic fully come alive again on stage.